As mobile technology advances, even budget smartphones have multi-core CPUs and a couple of gigabytes of RAM, making them far more capable than their predecessors in the low-end market bracket. In pace with the industry’s development, Google has decided that it’s high time for its mobile operating system to work exclusively with 64-bit apps. Or at least to start the move towards that goal. How will that affect you, the user? In a good way, if app creators are diligent about their software. Using the 64-bit architecture apps will be able to make use of your device’s full potential which means better performance and access to the latest hardware innovations. The news shouldn’t come as a surprise to anyone involved in Android app development, considering it was first mentioned by Google back in 2017. What Google’s latest post on the Android Developers Blog does is put things into a stricter time-frame and add some guidelines for developers that might have trouble with the transition. 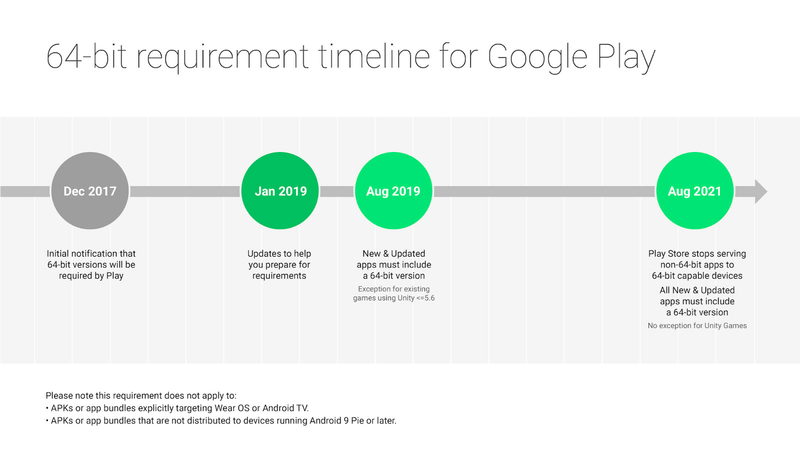 According to Google’s timeline, starting August 1, 2019, every new app that’s being added to the Play Store must have a 64-bit version. Same goes for any updates released for existing apps after that day. Google’s making an exception for some games that are relying on Unity 5.6 or older engines since its developers only recently added 64-bit support and the transition involves a lot more work than your average Android app. 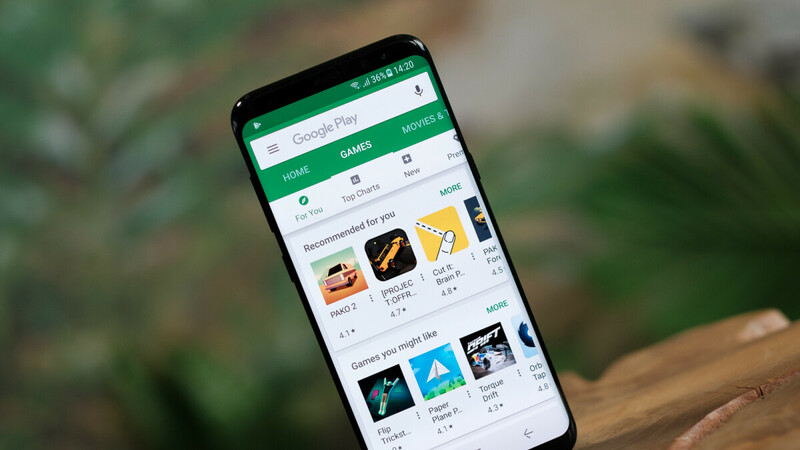 Google will continue to support both 32 and 64-bit versions of Play Store apps and games for two more years and on August 1, 2021, will remove all apps that don’t have a 64-bit version. The requirement won’t apply for Wear OS devices and Android TV, which don’t support 64-bit code. This means August 1, 2021, will officially put an end to the 32-bit era, at least when smartphones are concerned. On Apple’s side, 64-bit apps have been the norm since iOS 11 (released in 2017). That shouldn’t surprise you since Apple also supplies all the devices that are running iOS and they all have high-end hardware, while Android can be found on everything from a glorified calculator to the latest $1000+ smartphones, something Google keeps into consideration when making such decisions. I thought android is satisfied having their apps 32-bit? At the end of the day every Android smartphone these days has a 64 bit SoC. That's including a lot of the lower end models as well. Sure their might be some SD 2XX SoCs out there, including dsome low end Mediatek SoCs as well. But overall every Android sold today has a 64 bit chip, so it only makes sense to make every app a 64 bit app. Not sure why you are mentioning this to me since I already know this. I think he is trying to hijack the comment chain to get more exposure. Wasn't trolling though so its all good. “Thought” implies that he has a brain to actually think with. Sigh...another lie. "Focus on developing 64 bit apps, we're ditching the 2016 mid range device so that people will buy new phones." Let's be honest here google, do people really need 64 bit technology for candy crush, facebook and instagram? I can understand games but for work apps like word and excel, it's useless. Regular work apps are already fast. All I'm saying is that 32 bit support should continue. I disagree. The hardware from the past few years is already oriented towards 64bit support, why not use it? Holding onto older less efficient means is not going to benefit the users, developers or hardware makers. If anything I think this move comesa bit late. So kind to call garbage phone a glorified calculator. Ignorant! Im referring to Android garbage phones. But most Android TVs use old 32bit SoCs. I understand that (no wonder Google is making new requirements for Android TV devices). But there are 64bit SoC TV's out there, so why wouldn't they support both 32/64 bit. Especially since native Java apps are very easy to run in 32 and 64 bit (although not that many apps use purely Java). "Google tells Android developers to focus on making 64-bit apps, sets end date for 32-bit support" It doesn't end 32bit apps support -- it will require a 64bit version of the app when a new app is added or updated. Did you look at the picture? By August 2021. Playstore will only support 64 bit apps. And by that time. You'll only be depending on playstore alternatives.